Is it just me or does anyone else miss high school and college? I was always eager to grow up but as I get older, I start to miss my classroom days more. Maybe not so much the studying but the less responsibilities was always a treat. With backpacks trending this season, I wish I could go back in time and incorporate these snakeskin and leopard bags for my college days. When I got this bag, I, immediately, wanted to channel my inner school girl days. It's such a chic accessory and it amps up any look to fab. I kept it very preppy with a tie front blouse but added a touch of destroyed denim to keep it casual. I have been loving a bold lip lately and I can't stop wearing lip stains. I have always been a lipstick gal but lipstains dry matte and stay on all day without rubbing! It's amazing! Aside from deep red lip colors, hats have become an investment for me and you will be seeing a lot more this fall/winter. What are your thoughts on the backpack? I wish they were this chic when I was in school! You look so beautiful Lilian!! Your hair is always flawless and the way how you style your outfits is amazing, you've brought daytime outfit to a whole new level with your elegant and feminine approach! Stunning shots! 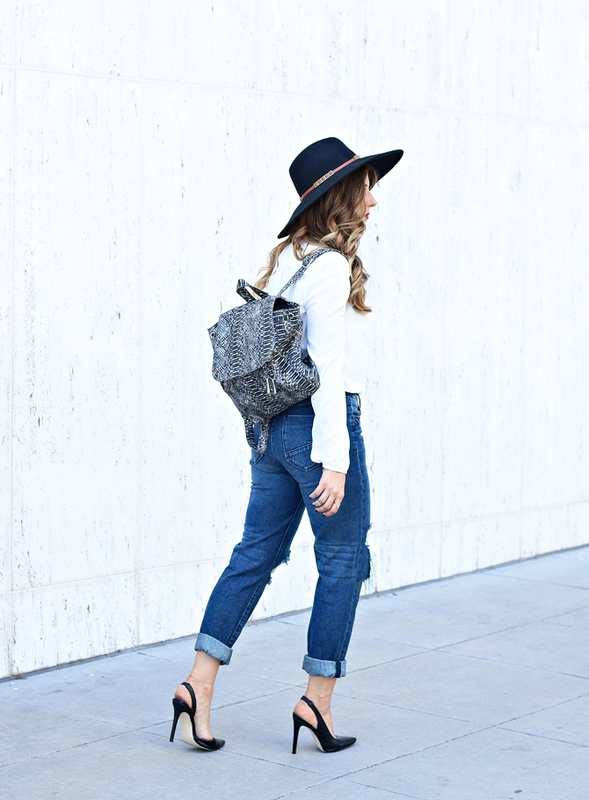 Love that backpack and jeans.